Location: From the town of Vanderhoof turn south off Hwy. #16 and travel south for approximately 75 km. (45 mi.) via Kenny Dam Road/ Kluskus Forest service road. Turn south at Km 59 of the Kluskus on to Gold road for 4 kms. Finger Lake is only a two hour drive from Prince George Airport. 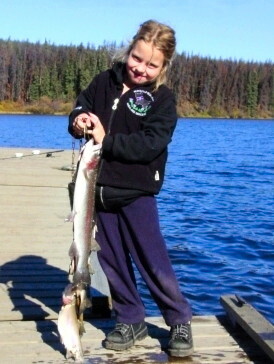 Finger Lake supports fisheries of Rainbow to 5 lbs and Kokanee to the 2 lb. range. Resorts & Campsites: Finger Lake Wilderness Resort is the only access to the water, which is 9 km long and 2 km wide (5.6 x 1.5 miles), 877 hectares in size, with several islands and bays to explore. Fishing Report: Finger Lake supports fisheries of Rainbow up to 5 lbs and Kokanee, which also reach into the 2 lb. range. Lavoie Lake - Lavoie Lake lies just west of Tatuk and can be reached by travelling approximately 80 km. (50 mi.) south from Vanderhoof on the Klukus Forest Service Road. Good populations of Rainbows up to 4+ lbs. inhabit this lake. There are also many smaller hike-in lakes nearby which contain good numbers of Rainbow that range in the 2 lb. range. Tatuk Lake - Tatuk Lake, lying just south of Finger Lake, offers rainbows up to 4+ lbs, however the lake also produces good numbers of Kokanee. Trolling is the method of choice in this large lake.